There's a less obvious reason why you should know how to use a Jewelers Loupe before you invest money in Antique Jewelry that many retailers don't like you to know. They say you can tell a lot about a tradesman by the way he uses his tools. In the same way, you can tell alot about your customer by the way he handles the Jeweler's Loupe (also called a hand lens). If it becomes obvious to the dealer, that you don't know how to use a jewelers loupe, chances are, you don't know much about Antique Jewelry either. There's a right way how to use a jewelers loupe (hand lens). Knowing how to use a jewelers loupe is an Antique Jewelry Buying Basic. The Jewelers Loupe can tell you important information that will help you a great deal, when you know how to use the instrument effectively. Antique Gold Jewelry, practice how to use a jewelers loupe, at homebefore you try impressing the dealer at your local Antique Jewelry store. save you from making costly mistakes by understanding what the loupe can tell you about the jewelry by way of loupe magnification. give a clear signal to the dealer that you are not a complete novice. Jewelry loupes ( pronounced "loops" ) are a special type of magnifying glass. The jewelers loupe is a very practical tool to use once you master it and with practice it will become more and more valuable. 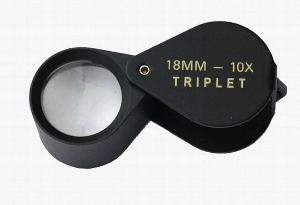 The one you need is a loupe 10 X ( ten power) triplet which can be obtained from any optical supplier. Why must the loupe be 10 X ? The loupe should be 10 X because the Federal Trade Commission in the United states requires grading to be done under 10 X power magnification. *** Any flaws that do not show up under 10 X loupe magnification are considered non-existent for grading purposes. 5 Easy Steps to Loupe Success! Hold the jewelers loupe between the thumb and forefinger of either hand. Hold the object with the thumb and forefinger in the other hand. This step is important: now bring both hands together so that the bottom part of both thumbs come together, the thumb holding the loupe will rest on top of the other thumb. The lower wrists will become the pivotal point. Now move your hands close to your nose or cheek with the loupe as close to the eye as possible. You do not have to close the other eye. If you wear glasses you do not have to remove them. Steady Eddy - your hands must be steady for careful examination. This is how you steady your hands. With your hands together braced close to your face, holding the jewelers loupe in this position just described, put your elbows on a table or countertop. If there is no countertop available, brace your arms against your chest or rib-cage. The loupe should be approximately one-inch from the eye and about an inch from the object being examined. A 10 x loupe is difficult at first to focus but with practice it becomes easier. Play with the object being examined and rotate it slowly, tilting it back and forward while looking at it with your loupe from different angles.